We moved to Vancouver, Washington this past winter and there are large pastures close to our home. I love to see all the farm animals grazing on the lush land. Close to our place there is a home with dozens of lambs out on their field. There are so many baby lambs out there right now - one of my favorite parts of spring. 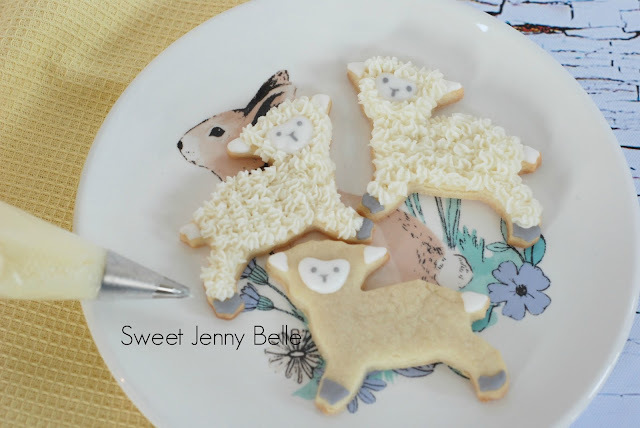 With Easter right around the corner, I thought it would be the perfect time to make some buttercream lamb cookies. I'm still learning my way around buttercream, so I did use a bit of royal icing on these as well. The two frostings play nice together and provide very different textures. 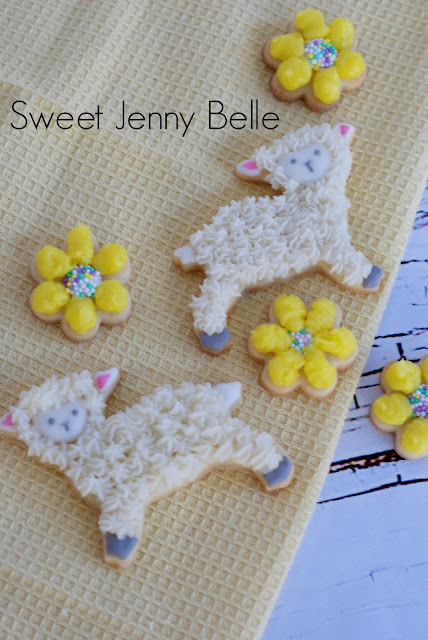 I made a delicious lemon buttercream that is perfectly paired with the vanilla cookies. This icing does crust, but it doesn't harden like royal icing - you won't be able to mail these. They are perfect to bring over for Easter celebration or baby shower brunch. What do you need to make these? I use tipless bags for my royal icing or you can use the traditional reusable icing bags with a 1 or 2 tip. 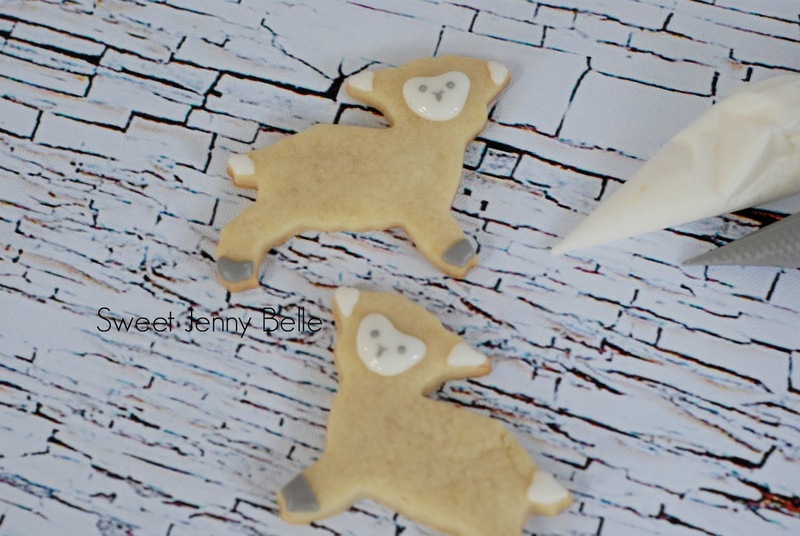 Using the grey royal icing, frost the hooves of the lambs. 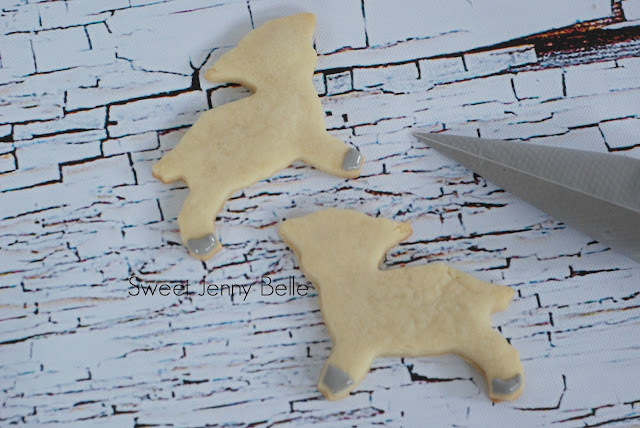 Switch to the ivory royal icing and frost the tail, ears and face. The face of the lamb is like a chubby heart with soft edges. Before the ivory icing sets, add two small grey eyes and a little line for his mouth. Using a toothpick, carefully drag the corners of the mouth out to give the appearance of a small nose. Place lambs in a dehydrator at 90 degrees for about 10 minutes or allow the cookies to setup, about an hour or two. 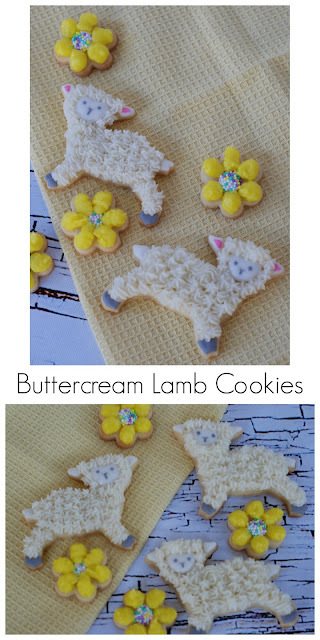 Using Wilton tip 16, fill in the rest of the lamb body with little swirls of lemon buttercream. I try to make the swirls fairly small so that it has some definition and the appearance of a furry coat. In a large mixer, cream the butter until soft and light. Drizzle the lemon simple sugar into the bowl and blend. Add 3 cups of the powdered sugar and gently mix together. Add the lemon juice and remaining sugar, mixing until will combined. Feel free to add a bit more lemon juice if frosting is too thick. I also added a couple drops of Wilton's Meyer Lemon flavoring to boost the citrus sweetness, but it's optional. Want to add a bit of pink to the inside of the lamb's ear? In a small glass bowl, mix a drop or two of the Americolor soft pink gel with a few teaspoons of vodka, everclear or clear vanilla. Using a food only paintbrush, paint a small bit of the pink on the ear. 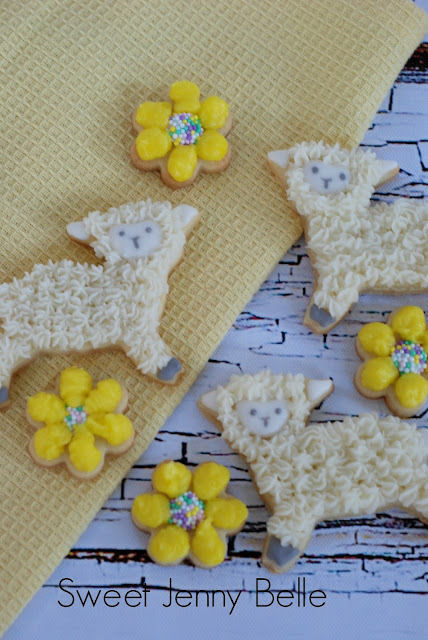 Now your sweet and delicious lambs are all set for the party. Aren't they adorable? Pretty easy and that lemon buttercream frosting will be your new favorite! Save any leftover frosting for my petit four tutorial that is just around the corner. Are you looking for my royal icing recipe? Well come on over here!